The three men — Mike Ramos, Bobby Titcomb and Greg Orme — are among the few people still in Obama’s life who knew him long before he was famous. Although their paths have long since diverged, they’ve made it a point to gather for frequent reunions, in one of Obama’s most visible links to the days when his life was much simpler and his problems more mundane. On this visit alone, Obama has spent more than 22 hours with the group on the lush golf courses that dot the island of Oahu. When it rained, Obama and his pals went bowling, instead. And on Tuesday, in what’s become a yearly tradition, the men and their families gathered for a luau hosted by Titcomb. With rain drizzling over Oahu, Obama’s motorcade whisked Obama across the island to Titcomb’s beachside home in Waialua, about an hour outside of Honolulu on the North Shore. Increasingly, the reunions have become the focal point of Obama’s family vacations in his second term, as his teenage daughters spend less and less time at their father’s side. Once content to join their parents for outings to the aquarium or to get shave ice, Sasha and Malia are now more independent. Since arriving more than a week ago, Obama has been out in public with one of his daughters only once, briefly, during a hike. What Obama and his companions talk about during their many hours alone is anyone’s guess. But the foursome rarely goes more than a few months without reconvening in one arrangement or another. In August, Obama kicked off his 53rd birthday weekend golfing with the three friends in suburban Maryland before heading to Camp David, the presidential retreat in the Catoctin Mountains. Far less is known about Obama’s buddies, of course, than about the president himself. All three live mostly private lives when they’re not being photographed with the commander in chief. Ramos, who graduated from Punahou in 1978, bonded with Obama over their mutual affinity for jazz. He’s lived in Colorado, but was listed as a North Carolina resident when in 2012 he attended a state dinner at the White House that Obama held for British Prime Minister David Cameron. 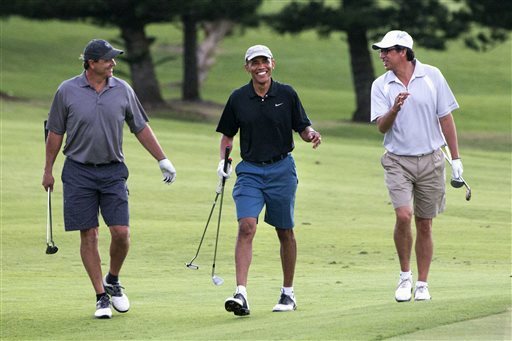 Titcomb, who golfed another two days with Obama this month before the others got into town, was a year behind Obama at Punahou. Titcomb has worked as a commercial fisherman and an airline employee, according to the school’s alumni magazine. In 2011, he pleaded no contest to soliciting a prostitute, but Obama has stayed fiercely loyal to his childhood friend. Obama played basketball at Punahou with Orme, who the alumni magazine says is now a building contractor. Aging photos show Obama and Orme decked out in 1970s fashion with their dates before attending a high school prom. Among U.S. presidents, Obama is not alone in carving out time regularly to reconnect with his roots. Franklin D. Roosevelt made frequent trips back to Hyde Park, New York, throwing picnics or barbecues for former neighbors and friends, and George H.W. Bush remained pals with men he served with in World War II. In the second term, presidents have often sought refuge from the pressure by disappearing into nature to fish or hunt, said Douglas Brinkley, a presidential historian at Rice University. But such solitude has become less and less attainable for presidents in modern times.